Hello my fellow Rush fans! Alex Lifeson has given me permission to backwards engineer and meticulously blueprint his iconic Hentor Sportscaster so that I may make and sell accurate replicas. I have had the Hentor in my possession for about 6 months and have documented every property and detail of this amazing and unique sounding guitar. Alex’s only stipulation was that for every guitar sold, a portion of the profit goes to his charity “Grapes Under Pressure”. While in my possession over the last few months I made suggestions to Alex on upgrading the guitar. The Hentor now sports Dimarzio single coils and also a large brass sustain block for the Floyd Rose, the biggest one I’ve seen and yet there is still a good amount of movement available. These two upgrades as well as others are listed in my OPTIONS category. Floyd Rose no fine tuners. Quartersawn unfinished maple neck/ebony fret board with medium jumbo frets. Hentor Sportscaster logo on peghead face, Freddy Gabrsek logo and serial number on peghead back. 70’s style strat body finished in nitro lacquer. Body weight, wood species and resonance to match the original Hentor. Hentor Sportscaster replica – A testimonial Freddy has kindly allowed me to provide the opening testimonial not only in celebration of the first Hentor Sportscaster replica to emerge from his workshop, but also as my tribute to him as a skilled craftsman and friend. Since Freddy had worked on the original Hentor for Alex Lifeson (and incidentally, many other guitars for Rush too), the sound of the famous Sportscaster guitar in particular seemed to shine above all others. Born a fender Stratocaster (circa 1973), the guitar had been subject to various modifications by Alex over the years. His intention was to beef up the sound and move it closer to the Gibson output he had been so used to. After the experimentation and inclusion of a new bridge pickup and wiring, tremolo system and neck, he had by intention formulated a winning mixture of components creating a truly incredible and unique sounding guitar. 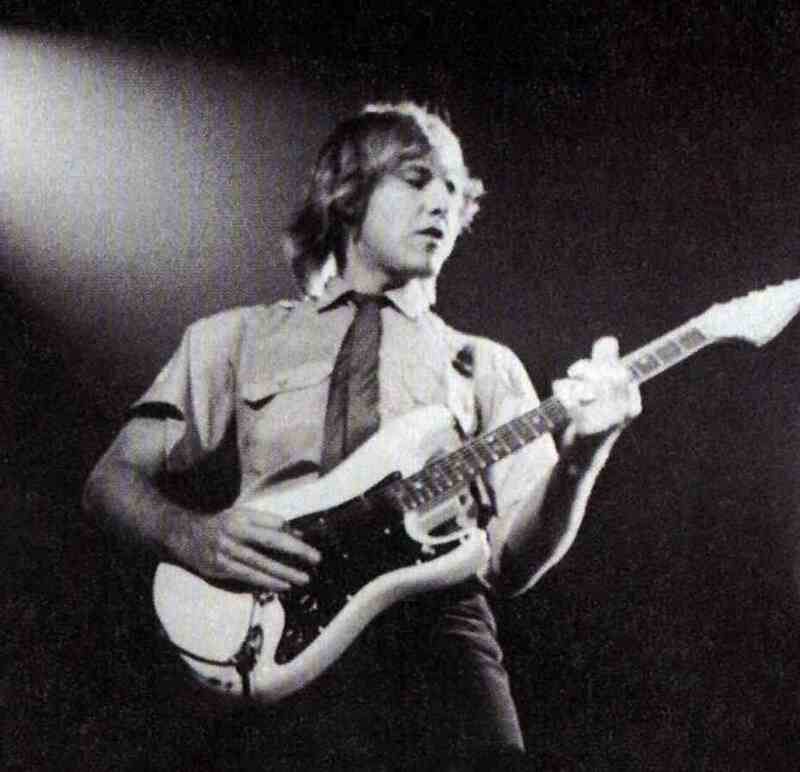 The ‘Hentor Sportscaster’ as it would become affectionately known, (named after Rush producer Peter Henderson) would be the faithful axe that would travel alongside Alex for many years to follow, and would notably accompany him in forming the famous Lifeson ‘soundscape’ as heard in the acclaimed Rush album and best seller ‘Moving Pictures’. If my memory serves me correctly, some time ago Freddy and I had been discussing a custom build Hentor replica for myself, and I remember he pledged that if he were to build one replica then he would make it two as he wanted one also! “The sound of the Hentor was so awesome” he recounted, “like no other Stratocaster I had ever played”. Some time passed, and I remember receiving an email from an excited Freddy saying that he had been in touch with Alex and had incredibly swung a deal with him to borrow the original Hentor in order to study and back engineer some copies (the Hentor receiving a refurbishment in the process as it was looking tired). This way, not only did Freddy and I get our Hentor replicas, but they would become available (in strictly limited numbers) to other Rush fans too! Alex, showing his generosity, simply asked that a portion of the proceeds from each sale go to his charity ‘Grapes Under Pressure’. Months passed by, and I am sure many late nights saw the Freddy’s F rets workshop window illuminated until the early hours of each new day. Finally the batch of Hentors was ready, and my replica – serial number 1 was finished! Long ago, Freddy and I had previously agreed that each of our personal Hentor replicas would be named ‘Holy Lickmaker’ (see picture) in order to commemorate an inside Rush joke. All subsequent models would of course feature a one piece ‘Hentor Sportscaster’ decal, perfectly recreated to represent the original ‘Letraset’ text as per the original Hentor headstock. As I happened to be passing Niagara Falls at the time, Freddy invited me to pop in and see my finished guitar. Picture the moment; Freddy undoing the case and slowly opening the lid. My heart racing and eyes like saucers I watched closely. I gasped as the lid revealed the white hero guitar beneath. AWESOME! Let me tell you that if you intend to or have already ordered one of these guitars you will not be disappointed! The unique features of this guitar become immediately apparent. The Humbucker bridge position pickup (in my case the Bill Lawrence L500), the Floyd Rose (no fine tuners) tremolo just as I had chosen, the Gibson style pickup selector switch, and all finished with the single volume and tone pots as featured on the original Hentor. For the finish, Freddy has nailed the Hentor white exactly and this appears to his usual flawless showroom standard. And the most important piece – the recreation of the famous ‘Shark’ neck (no longer available) that Alex had fitted to the original Hentor. This is the business end of things and it feels gorgeous! There is no lacquer on the neck and a little on the headstock (to seal in the decal) with a fine demarcation line on the rear of the headstock. This quartersawn unfinished maple neck and ebony fret board is a work of art in itself, and the craftsmanship in the shaping and fretwork is nothing short of fantastic – the best I have ever seen. As I always play my new guitars acoustically BEFORE plugging them in, I hold the E major chord and strum the initial cord with a brisk movement of my plectrum to feel the sound. WOW! Now is the moment when everything falls into place. I am experiencing the unique Hentor formula of wood and parts which have come together in unison to make this guitar ring with life. This thing chimes! It’s easy for me to explain, as over a thirty year period I have owned four Stratocasters (and still have one), I have also played many and they never felt like this! I get the guitar home and as the neighbours are in I plug into my lazy practice machine with headphones – my Boss BR1180CD. This allows me to browse through a few patches before dinner. What becomes apparent is how awesome the Bill Lawrence L500 bridge pickup is. I have tried all sorts of high powered Strat pickups over the years, my favourite being the Seymour Duncan ‘Hot Rails’ I used to have in my old white maple neck Strat. Now the Bill Lawrence is as raunchy, but one important difference, start to play up the neck and the notes stay nice and clean where my Hot Rails would get muddy. I can push the output to a bright, snarly and tone responsive distortion which when travelling up the neck stays good with exhilarating clarity, great definition for faster solos if you need it. Moreover, moving down the neck and pulling off some rhythm work and lower note riffs, this pickup delivers with a raunchy tone and high end sparkle. Rolling off the volume can also tame the L500 to taste, so you’ll need to experiment here in order to find what’s right for you. Flip the selector switch to the middle or rhythm positions and I find myself in Floyd territory! 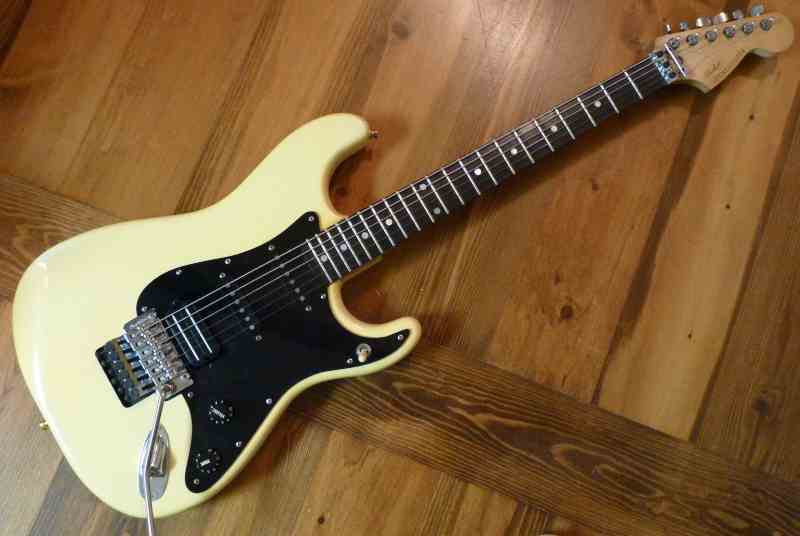 The Dimarzio FS-1’s I chose are much more lively than the Fender stock single coils, but they do retain the vintage Strat tone so it’s easy to be carried off in an indulging Dave Gilmour type expression, but rolling on the volume will accentuate matters nicely in order to exercise a few Malmsteen type runs. Now that’s versatility! I originally had Dimarzio SDS-1 ‘s in my old white Strat, but found these to be too high in the top end, so between the standard Fender single coils and the SDS-1’s, these FS-1’s are a perfect medium and compliment the L500 a treat. Applying some chorus and delay, they sound wonderful! As for the chosen Floyd Rose (NFT) tremolo I love it! It has just the right amount of pull back to give a beautiful vibrato (think Limelight) and despite my over enthusiastic bar work it stayed in tune throughout my melodic venture. Be aware that Freddy always said to me that part of the secret to the Hentor sound is in the Floyd NFT bridge, so bear that in mind the purists among you. Having owned the guitar for only seven days at this time of writing, my next port of call is with my Marshall 1987X stack, vintage distortion plus, and various washes of delay. (Exit neighbours). I can’t wait! Don’t forget that Freddy lists other available combinations for your personal Hentor build. The ‘Exit Stage Left’ era guitar for example, hosting a Gibson humbucker in place of the L500 pickup. In addition to this, you may wish to go forward in time and order your Hentor with the latest Floyd Rose tremolo unit (with fine tuners and locking nut) which exists on the Hentor today. Other choices also exist, so see Freddy’s web site, or call him to discuss your requirements. But remember, these guitars are strictly limited so don’t delay if you want to maximise your chances of obtaining one. I close my testimonial with a tribute to Freddy. As a highly skilled craftsman/luthier he has been blessed with the ability to produce handmade guitars to an unbelievably high standard of workmanship – they have to be seen to be believed! During the hours I have sat quietly in his workshop and watched him work, he employs all the skills there are for hand tool methods and techniques, utilising his experience learned in the theory and science of his trade. Forget your CNC mass produced guitars with high price tags, Freddy’s guitars are all painstakingly produced by hand with realistic price tags – the way we want them to be. Whether it is the manufacture of a new nut, a restring and setup, or indeed the creation or design of a replica or custom made guitar he treats all of his customers the same. In the time I have known Freddy as a fellow Rush fan, guitar enthusiast and friend, I know that he is incredibly well respected in the industry. Indeed, his list of previous clients speak for themselves! Freddy is a kind, generous and caring individual, highly skilled in his arts, and always striving for the ultimate perfection. I am proud to know you Freddy, and say that it is an injustice that we should live oceans apart - otherwise I would pop in more often! 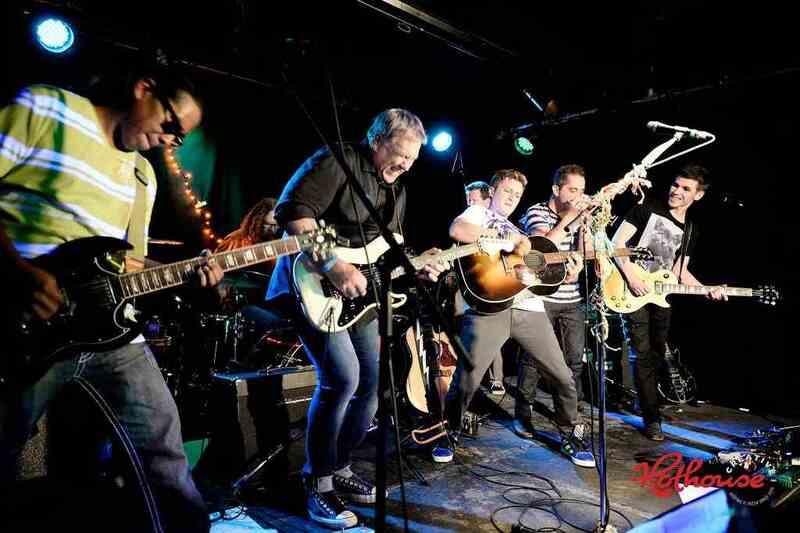 It's not often that one gets to play their hero's guitar. The Hentor Sportscaster is a guitar that I've been dreaming about since I first heard Rush, and Alex Lifeson's unique playing style. When Freddy decided to make spot on replicas of the iconic guitar, I couldn't help but jump in..... Independent of the guitar and what it represents from a historic standpoint, I wanted to share that Freddy has indeed created an amazing instrument that stands on its own. Great acoustic resonance on an electric guitar to me is a definite sign of great tone when the guitar is plugged in. The Hentor was loud and resonant, but focused with all notes ringing true, acoustically. No simple major barre chords sound as great as when Alex Lifeson plays them, and as such, this guitar definitely nails that '81-'85 Lifeson tone - the classic barre, sus2 and open string chord voicings sound amazing! The unfinished neck (feels like satin), ebony board, and brass trem block, and vintage Floyd Rose (no locking tuners) are all part of the secret formula as well...... :-) ..... without a doubt one of the best feeling necks on any guitar I have played. Thanks Freddy, for taking the time to do this project. I've got a great, well-crafted guitar that I can't seem to stop playing. Oh, and then there is that stupid grin I get on my face when I open up the case to grab the guitar..... it's Alex Lifeson's Hentor Sportscaster!!! Hey Freddy, I received the guitar yesterday at 10 AM. It's one of the greatest guitars I've ever played! I remember in the beginning, you told me that the Hentor was no ordinary Srat. Now, I understand. I plugged it in and couldn't believe that a Strat style guitar had such a huge and thick sound! I've never played or heard anything like it. The neck is incredibly smooth and comfortable. This makes playing the solo from "Analog Kid" a little bit easier! Anyway, thank you so much for building such amazing instruments and for making my dream of owning a Hentor Sportscaster come true. I have been aware of the legendary Hentor Sportscaster for years and when I found out that these unique guitars were being recreated in limited supply, I contacted Freddy immediately. From my initial contact with Freddy, my expectations have been exceeded. Your responsiveness and guidance on the build project were outstanding. The craftsmanship and attention to detail are just incredible and this this is the finest neck I have played. The aesthetics are just right and the guitar has it's own identifiable sound, a beautiful snarl that sits perfectly in the mix. This guitar just screams through my rig, truly inspirational. Fred: I want to thank you for completing such a spectacular job on the guitar. The quality and craftsmanship is outstanding and sounds more unique than I ever envisioned. This instrument has given me renewed interest in playing and recording once again.